FIXYOURTHINKING.COM / Need a brain? Borrow mine! : Paid reviews? This is definitely in "the absurd news of the year thus far" category in the Mac blogging world. 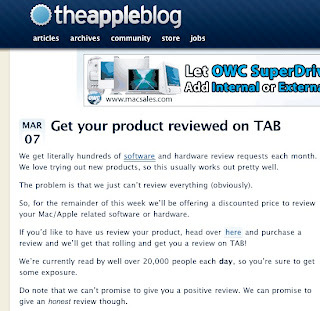 The Apple Blog announced yesterday that it would start CHARGING to write reviews on it's website for companies. We get literally hundreds of software and hardware review requests each month. We love trying out new products, so this usually works out pretty well. The problem is that we just can’t review everything (obviously). So, for the remainder of this week we’ll be offering a discounted price to review your Mac/Apple related software or hardware. First of all ... I doubt seriously they get hundreds of requests even each year. The Apple Blog is a pretty obscure blog. Don't believe me ... just look at their ALEXA ranking page. They get roughly the same traffic as this website. "We’re currently read by well over 20,000 people each day, so you’re sure to get some exposure." The idea is that you review the best and most interesting products. Not the ones that pay you. It’s totally cool to let developers pay you to get their app mentioned on your web site, but there’s a word for that: advertisement. Besides this ... 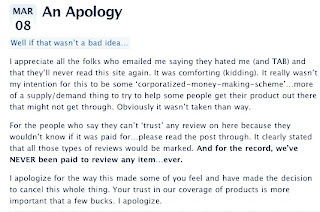 I have reviewed dozens of products for this website ... I have yet to have a company tell me I can't keep the review product. There's some compensation for a review right there. If you review hardware and don't like it - sell it on eBay. This is what Bill Palmer does on the iProng website. Geez ... that didn't take long.